How do I get an Allowance to appear on my employee's Payment Summary (Group Certificate)? Note: Tax Scales between 61 - 70 are for contractors and not individuals. The flat rate scales in the 61-70 range will need to be changed to something in the 1 - 59 range for the allowance/s to appear on the Payment Summary. 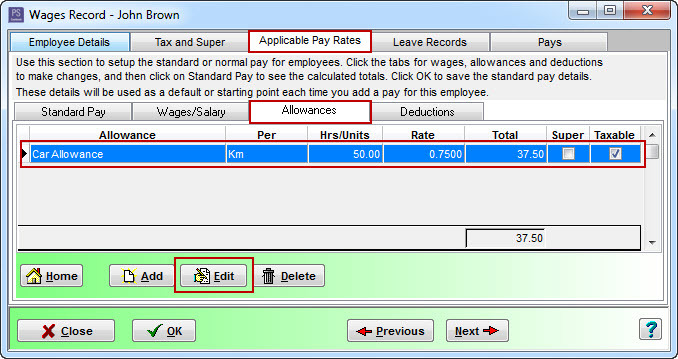 Click on the Payroll toolbar icon. Click on the required employee to highlight. Click on the Select Employee button. Click on the Applicable Pay Rates ( or Default Pay Rates) tab. This will only affect new pays done after this change. 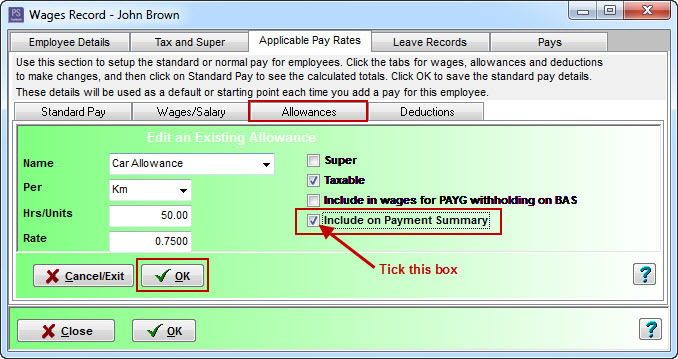 To change existing pays, click on the Pays tab instead of the Applicable Pay Rates tab, edit the required pay, select the Allowances tab and modify the required record(s). Click on the Allowances tab. Click on the required allowance (eg. Car Allowance) to highlight and then click on the Edit button, or click on the Add button to add a new default allowance. Tick the Include on Payment Summary check box.